Brand has a really big character model too. He’s as big as a tower! Locke wrote this one. He tends to write the League of Legends comics, it would seem. This entry was posted on Wednesday, February 29th, 2012 at 12:00 am and is filed under Comics. You can follow any responses to this entry through the RSS 2.0 feed. Both comments and pings are currently closed. Wow. I never thought about it. Riot’s proportions are all off. There’s no freaking scale what so ever. 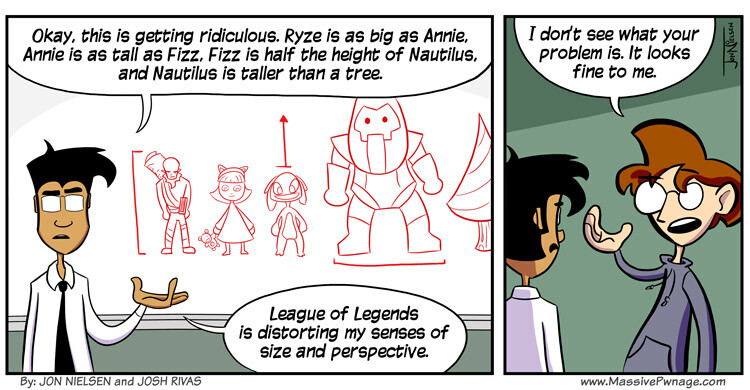 Fizz should be the size of a yordle. Realy true.. Just look at Twisted Fate. Oops, I meant to say ‘larger’ like the car mirrors do. Damn, I messed up a good joke. correct proportions are important things everyone needs, like poptarts and toilet paper. y’know i used to eat poptarts (just like you, but then i took an arrow to the knee, lol overused joke, but seriously i used to) but then i stopped, THEN i started reading these comics, now i eat poptarts again. my fave is the purple with blue squiggles on it, wild berry i think, icecream sunday is good too. Oh wow I feel like a moron. When I read this one this morning I completely missed the punchline.